Today’s newsletter from Australian Publisher Allen & Unwin highlights a new release of interest to Aussie crime fiction fans. 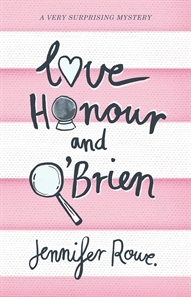 It’s the first adult crime novel in 13 years from Jennifer Rowe who penned six terrific whodunnits featuring curmudgeonly TV researcher/amateur sleuth Verity Birdwood in the 1990’s and followed these up with two police procedurals that became the basis for an Australian TV show (Murder Call). Sadly (from my perspective though not I assume for her younger fans) Rowe has been writing children’s fiction (as Emily Rodda) since the last of these adult novels was published in 1998. Holly Love’s in big trouble – she’s got to find the cheating swine who ripped her life apart, which turns out to be a huge mystery involving a gloomy old house, a hearse-driving Elvis impersonator and a gang of vengeful thugs – not to mention a possessed parrot and a very cute guy who might just take her mind off all her woes! A funny and hugely entertaining mystery from a brilliant storyteller. The book is set in the Blue Mountains west of Sydney (where Rowe lives and where my favourite of her Verity Birdwood novels, Grim Pickings, was also set). Even though this looks like quite a departure from any of Rowe’s previous adult fiction I’ll be getting my hands on a copy of this one soon as I’ve always thought Rowe a terrific writer.